How Do You Evaluate an Expression with Exponents? Need to plug in a variable value into an expression? Great! Does the expression have an exponent in it? Even better! Follow along with this tutorial as you see how to simplify an expression for a given variable value. Write and evaluate numerical expressions involving whole-number exponents. 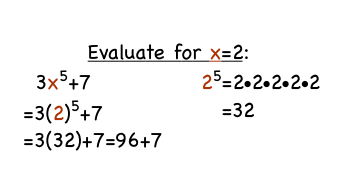 How Do You Evaluate an Exponent? Exponents just indicate repeated multiplication. Watch this tutorial to see how you can evaluate an exponent by first writing it in expanded form. Take a look! Understand p + q as the number located a distance |q| from p, in the positive or negative direction depending on whether q is positive or negative. Show that a number and its opposite have a sum of 0 (are additive inverses). Interpret sums of rational numbers by describing real-world contexts. Use the properties of exponents to transform expressions for exponential functions.